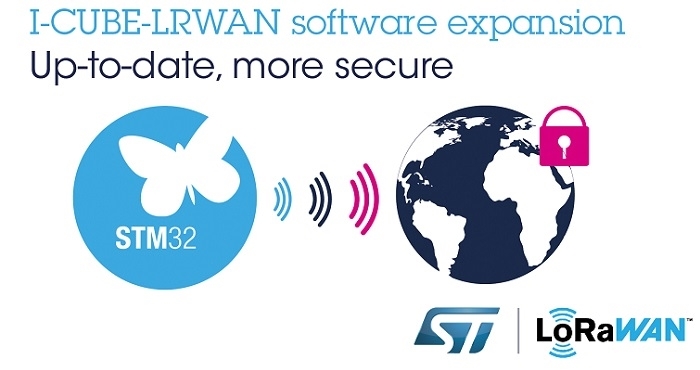 STMicroelectronics is updating its I-CUBE-LRWAN Expansion Package for the STM32 family of microcontrollers with the recently approved LoRaWAN 1.0.3 specifications from the LoRa-Alliance. The new update is set to make the microcontrollers up-to-date and more secure, further expanding the possibilities for Internet-of-Things (IoT) applications that operate on Low-Power Wide Area Networks (LPWAN). The I-CUBE-LRWAN expansion package consists of a set of libraries and application examples for the full portfolio of STM32 MCUs, including the ultra-low power STM32L0, STM32L1, STM32L4 and STM32L4+ series microcontrollers operating in IoT end-devices. With security a growing concern among IoT developers, the libraries include a dedicated Application Programming Interface (API) to manage Secure Elements, such as the STSAFE-A product family, and enable a range of data-protection capabilities. To increase application flexibility, the LoRaWAN 1.0.3 update added compatibility with Class B devices. Trading flexibility for power efficiency, the three device classes suit any IoT use cases operating in the unlicensed RF spectrum from 433 MHz to 928 MHz. The upgraded I-CUBE-LRWAN package provides the drivers for the new sx126x Semtech radio and also supports the sx1261dvk1bas, sx1262dvk1cas and sx1262dvk1das shields. The package also includes an application suitable to run on NUCLEO-L053R8, NUCLEO-L152RE, NUCLEO-L476RG and B-L072Z-LRWAN1 Discovery kits embedding the CMWX1ZZABZ-091 LoRa /Sigfox module from Murata. The package also supports a USI LoRaWAN technology module through the I-NUCLEO-LRWAN1 expansion board.